location of each collectible to assist you in finding them. will unlock the achievement/trophy 'Sightseer'. and allow you to zoom in on specific structures or landmarks nearby. Upgrades will earn you the achievement/trophy 'Infused with Greatness'. way, usually to make things easier. them all up on a single playthrough! document and cross them out as you go! Still in the shop named “Hudson’s” after grabbing the above collectible. Look behind the counter you’ll find another VOXOPHONE. the entrance to find a KINETOSCOPE. table in the garden here is another VOXOPHONE. check out the KINETOSCOPE on the wall to the right. of this statue to find the VOXOPHONE. between the cages on the left for a VOXOPHONE. front of you. This is one of them. your passage. Go up and grab the first INFUSION UPGRADE from her. After exiting the house with the printing presses, clear the area. kill them all. Afterwards head up to the bar and pick up the VOXOPHONE. INFUSION UPGRADE. Grab the key next to it. the bedroom. Within you will find the INFUSION UPGRADE. Keep going on from the altar and eventually you will find a projector room. seal on the wall for a VOXOPHONE. find another present containing a piece of EQUIPPABLE GEAR. As soon as you enter the station, look to the right to spot a KINETOSCOPE. the maintenance area here you will find an INFUSION UPGRADE on a desk. Ride the very first sky-line until you come to a stop inside a building. the right to find a gift containing a new piece of EQUIPPABLE GEAR. the open locker there for a VOXOPHONE. find a VOXOPHONE on a desk against the right hand wall. door and grab the VOXOPHONE from the chair on the right. of this is a gift containing a piece of EQUIPPABLE GEAR. before you enter the Arcade proper. open office at the end of the corridor. Inside there is a VOXOPHONE. find an INFUSION UPGRADE on a desk against the right hand wall. Before exiting to the gondola platform, find the room you can enter. a small workbench area with a VOXOPHONE. TELESCOPE that you can use. a desk against the left hand wall. an open locker with a VOXOPHONE inside. Still in the main Soldier's Field area, find the Founder’s Bookstore. of the short flight of stairs. find a desk holding a VOXOPHONE. closest to the main area you will find a KINETOSCOPE. find a propped up Carbine. On the ground next to it is another VOXOPHONE. a cupboard on the back wall of the room. centre of the room is a lock pick and a VOXOPHONE. Along with the above Infusion upgrade. gondola. Inside it, there is a VOXOPHONE on a chair. the KINETOSCOPE at the end of the pathway. Minuteman’s Armory machine and you’ll find a VOXOPHONE. hand corner of the room to find an INFUSION UPGRADE on the table here. a piece of gift wrapped EQUIPPABLE GEAR. will find a piece of gift wrapped EQUIPPABLE GEAR. and you’ll find a VOXOPHONE on the chair in front of a fireplace. the room is a work bench with a VOXOPHONE on it. an angle from which to pick this one up. pick kit and gift containing a piece of EQUIPPABLE GEAR from the table. wrapped new piece of EQUIPPABLE GEAR. new piece of EQUIPPABLE GEAR. INFUSION UPGRADE from the table here. will turn all the police in the area hostile. end. As you enter, you will see Elizabeth disappear through another tear. with one holding a VOXOPHONE. able to grab an INFUSION UPGRADE from between the bars. containing a new piece of EQUIPPABLE GEAR. to the left. At the end of the hall here you will see a Veni! Vidi! Vigor! vending machine. On the wall to the left of this is a KINETOSCOPE. lockers to the right of it. Inside the open locker is a VOXOPHONE. box containing a new piece of EQUIPPABLE GEAR. directly in front of the door is a VOXOPHONE. After killing the handyman, he will drop a new piece of EQUIPPABLE GEAR. Find the Dollar Bill vending machine in the back right corner of the area. VOXOPHONE on the ground near some boxes against a wall. pick from under one of the tables. proceeding in that direction, look on the nearby stool for a VOXOPHONE. of cells. Elizabeth can unlock the door to cell 8 (requires 5 lock picks). Inside you will fins a new piece of EQUIPPALE GEAR. and grab it for another KINETOSCOPE. proceed up the street on the left hand side of the large central building. end. Through here is a small wooden docking area overlooking the clouds. There is a locked door here that Elizabeth can open (requires 1 lock pick). INFUSION UPGRADE and a VOXOPHONE. Inside the safe with Infusion Upgrade 15 above. to unlock another collectible in the next chapter. should be able to spy a gift box at the base of a statue on your right. Grab this for a new piece of EQUIPPABLE GEAR. the covered area you will find a VOXOPHONE. INFUSION and a gift containing a new piece of EQUIPPABLE GEAR. In the same room as the above collectible. on a desk to the right. nearby to open it and grab your reward – an INFUSION UPGRADE. will find an open door. Under a desk in here is another VOXOPHONE. here. Under the body you will find a VOXOPHONE. left hand side of the bar inside is a new VOXOPHONE. the left you will find another new VOXOPHONE. before entering the building use the TELESCOPE here. TELESCOPE on the railing (near the tesla coil tear). you will find a VOXOPHONE. to find an INFUSION UPGRADE on a table. INFUSION UPGRADE at the end of a hallway in a metal tub. the gondola station for a TELESCOPE. corpse on it. There is a VOXOPHONE on the floor below the chest. between the two bathrooms you will find a KINETOSCOPE. Founder’s Bookstore (requires 1 lock pick). As you enter look to the right. On a counter beside a teddy bear you will find a VOXOPHONE. back to the Salty Oyster and once inside, go over to the bar on the left. Look beneath the cash register for a previously non-existent button here. vigor – Return to Sender, a lock pick kit and an INFUSION UPGRADE. the room is a VOXOPHONE. a new piece of EQUIPPABLE GEAR. elevator. Get Elizabeth to unlock the door here (requires 3 lock picks). Inside you’ll find a VOXOPHONE. carton on a shelf with a VOXOPHONE in it. gift containing a new piece of EQUIPPABLE GEAR. On a counter to the right of the above EQUIPPABLE GEAR is a VOXOPHONE. statue of the woman directly in front to find a VOXOPHONE. look to the left for a TELESCOPE. Note: It is possible to find the three tears in this area in different orders. and end up back at Z.H. Comstock Victory Square. the room you will find a VOXOPHONE. will find an INFUSION UPGRADE on a table. right. Here on a table at the back of the room is a VOXOPHONE. it will leave behind a VOXOPHONE. is a gift containing a new piece of EQUIPPABLE GEAR in there. Company’. This building has a door we can unlock (requires 3 lock picks). There is an INFUSION UPGRADE inside. called 'Hudson's'. Go inside. Downstairs you will find a safe we can open. that contains an INFUSION UPGRADE, a lock pick bag and a VOXOPHONE. Inside the safe with the above collectible. Still in the same area as the previous Voxophone, interact with the tear. will leave behind a VOXOPHONE. elevator. Inside the elevator is another tear and a VOXOPHONE. When you run into the second Boy of Silence, enter the door to his left. On a pillar near the dead end here is a KINETOSCOPE. When you run into the second Boy of Silence, enter the door to his right. the VOXOPHONE from the table. the back right hand corner of the room to find another projector on a desk. Sitting on the desk next to this is a VOXOPHONE. When you enter the elevator again, grab the new VOXOPHONE that is now here. is a desk with an UPGRADE INFUSION and a VOXOPHONE. On the table next to the above Voxophone. VOXOPHONE on the floor between 2 desks. Prophet's Zeppelin to find the last TELESCOPE. will find a locked door that Elizabeth can open (requires 1 lock pick). with a VOXOPHONE on it next to a flag. side of the ship from the control console. There is a locked door here. of the room on a desk is a gift containing a piece of EQUIPPABLE GEAR. Following the scene with Comstock, enter the door behind the fountain. with a VOXOPHONE and a hand cannon sitting on it. Please include "Bioshock Infinite" in the subject line. button at the top of the page to help me out! 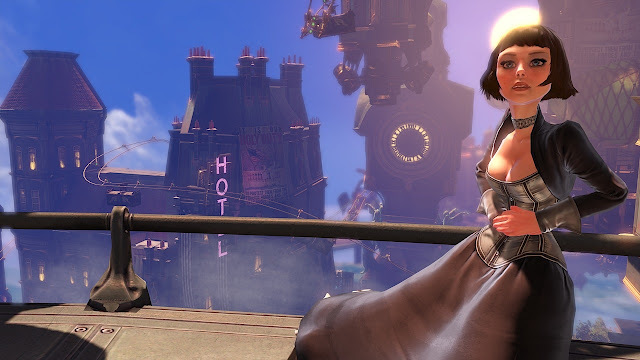 - Irrational Games for another awesome Bioshock game. Keep them coming! - Adamjp9 for pointing out a piece of Gear that i missed. > Completed guide with all collectibles listed in order of appearance. + Added a note about Season Pass rewards. + Added an additional piece of EQUIPPABLE GEAR to the Port Prosperity level. 'Unconditional' and 'A Soldier's Death'.